Federowicz shows the ball that ended in the cup on the 9th hole for the course's first ever ace. A record-setting first night at The Links at Coca-Cola Field included not only the course's first ace, but also the best round in the history of the event…by a pair of golfers. Brandon Federowicz of Orchard Park delivered the first hole in one in the course's history and then playing partners Sean Lindstrom of Hamburg and Simon Bennett of Aylesbury, England set a new course record by each shooting 5-under 22s. Lindstrom and Bennett matched each other stroke for stroke. When Bennett birdied hole four from the third base club level, Lindstrom responded with four straight birdies to pull even at -5. Both golfers parred the ninth hole, ending in a tie for first place. What made Lindstrom and Bennett's rounds even more impressive was their foursome also included Mark Travers of Hamburg, who sits in third place at -4 and Steve Demeo of Buffalo, who shot a 1-under, 26. All four golfers were bogey-free. A total of 10 golfers were under par on night one, a list that includes Federowicz at -1. 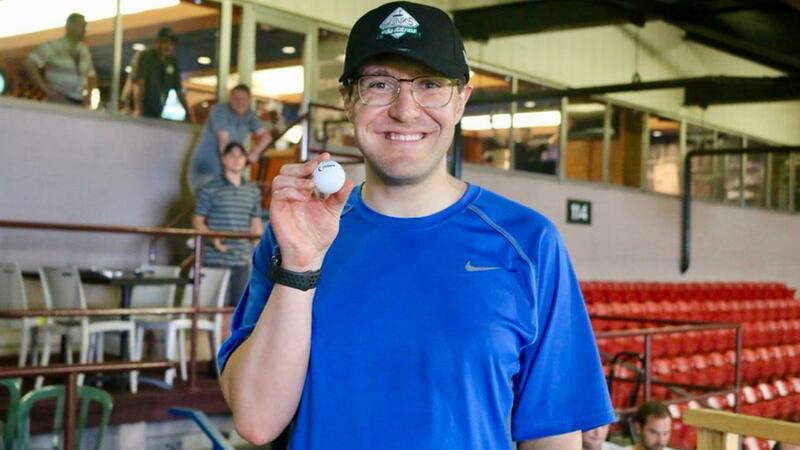 The 25-year old took all suspense out of the 'Closest to the Pin' competition on 81-yard ninth with the first ever hole in one in the history of The Links at Coca-Cola Field. Using an eight iron, the OP-native rolled his first ever ace into the cup to flip his score from one over par to one under. On the women's side, Patricia Hanavan of Tonawanda sits atop the leaderboard after a +3, 30. After a double-bogey on the first hole, Hanavan settled in with a pair of birdies before ending her round at +3. She leads her foursome playing partner Stacy Michalski of Tonawanda and Emily Hawkins of Eden by a single stroke. Tony Santopolo and Pat Denisco of Cheektowaga turned in the best twosome score of +3, a solid three strokes better than David McElroy and Jace Drysdale of Cheektowaga and four strokes better than the Bowers, Allessi and Misnik groups. The amazing -15 combined score of Lindstrom-Bennett-Travers-Demeo have them in a commanding lead on the foursome leaderboard. Second place belongs to group that includes Mike Benzinger (-3) of Orchard Park and Hamburg's Costa Kalonaros (-1), Sean Cannan (+3) and Jason Rice (+6) who were a combined +5. The Links at Coca-Cola Field will continue Friday night at 6:00 p.m. There are still a few tee times remaining for Saturday night's session that can be booked by CLICKING HERE.